Photos in slideshow: Valerie Hovland, Tunc Findik, Elselien te Hennepe, Bruce Manning, & Preston Stroud. Is your December going well? I encourage you to join our challenging 2010 climbing season in this ultimate newsletter of 2009. Please read down for discount offers, and do tell everyone about what we are trying to do, because we pay a 5% commission each time one of your friends or anyone you know joins our team. 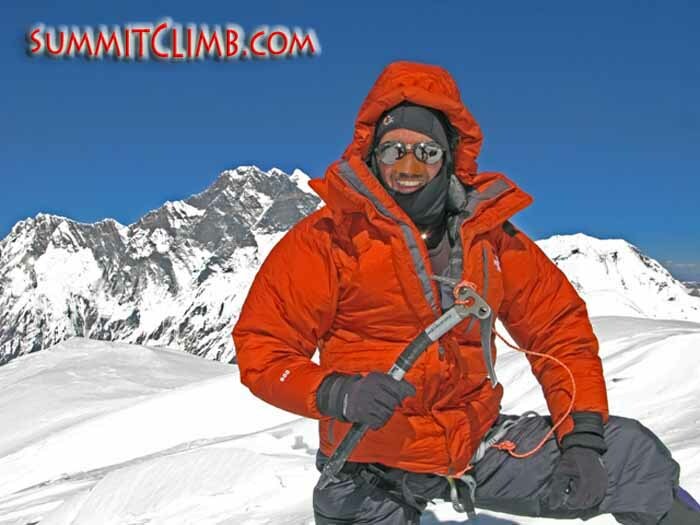 My name is Dan Mazur and I work for www.SummitClimb.com as an expedition leader. I’ve been lucky enough to lead 5 Everest teams of men and women of all ages to the summit of our world’s highest peak. Friends and I also climbed to the summits of K2, Cho Oyu 3 times, Ama Dablam 5 times, Lhotse twice and Shishapangma twice. 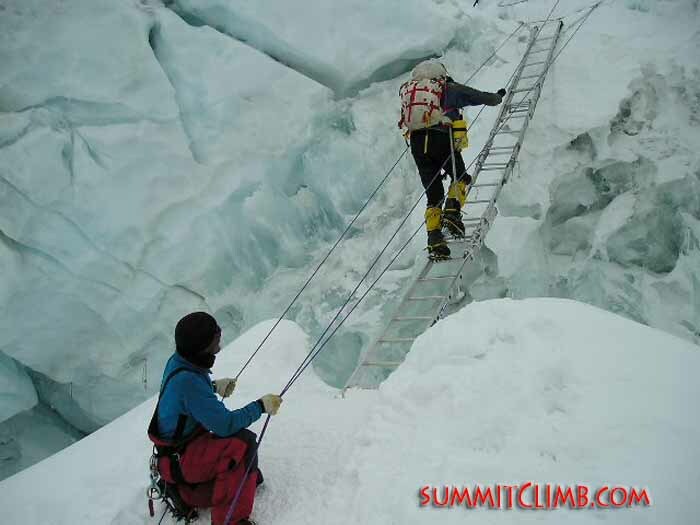 Oh by the way, I just found out Summit Climb are approaching their 19th year. 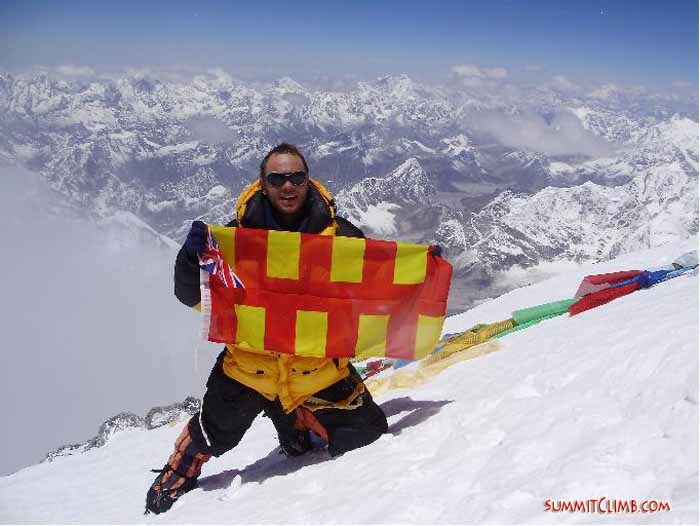 2009 was a successful year for our climbing teams, with members and sherpas reaching the summits of Everest-Tibet, Everest-Nepal, the North-Col, Cho Oyu, Shishapangma, Lhotse, Baruntse, Lobuche, and Aconcagua. 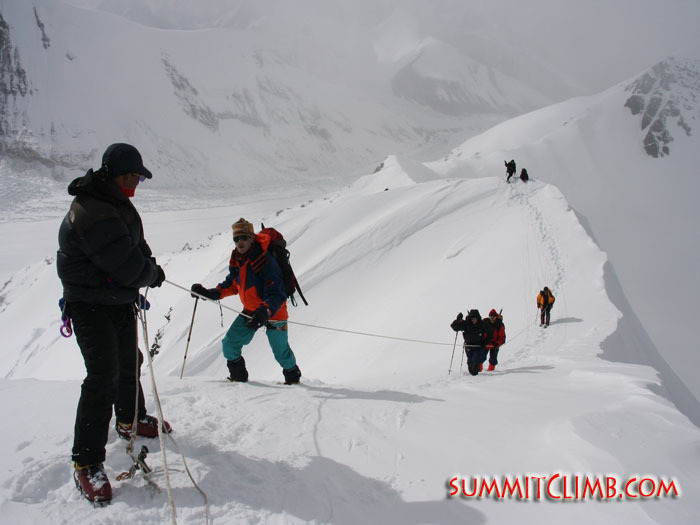 We were also accompanied by walkers on these expeditions, who made the trek to basecamp and some went even higher. We were blessed with superb weather, very strong and loyal sherpas, good equipment, delicious food, and may I say, excellent leaders. We look forward to 2010 and encourage you to join our friendly groups in forthcoming mountain adventures. We offer something for everyone, from beginner to expert , and the prices seem rather affordable. In fact, we are not going to raise any costs for 2010, but hold the increases until 2011. Please read down for additional 2010 discounts. 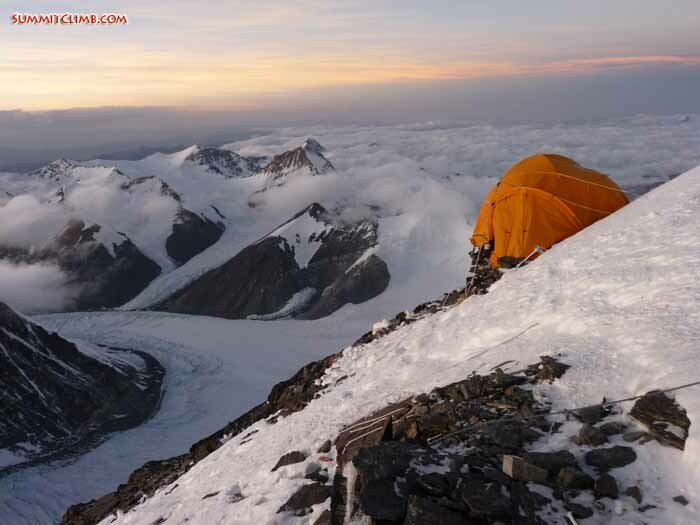 Camp 2 on Everest Tibet and a stunning view of the lower Himalayan peaks beyond (Gordon Hopper). Herve Coron on the summit of Mount Everest (Herve Coron). 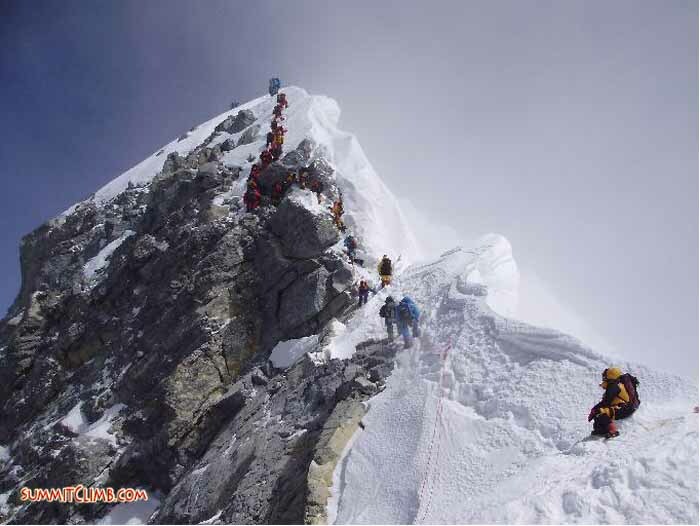 CLIMB MOUNT EVEREST in April and May. Led by Dan Mazur. Our 6th season on the Tibet side of Everest. The most affordable and less crowded way to climb Everest on the route made famous by Mallory and Irvine in 1924. Our Tibet-Everest teams have always been successful and always received a permit. The Tibetan authorities welcome us back with open arms for 2010. 6 members are currently signed on. Full Service Cost: $23,450, £14,150, €15,750. www.EverestClimb.com . 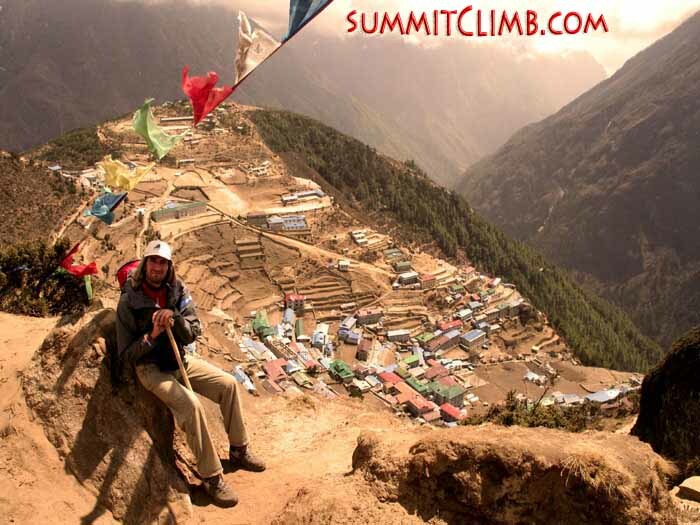 We also invite you to join our 7th annual Nepal-Everest climb. We have five members for Everest and three for Lhotse. 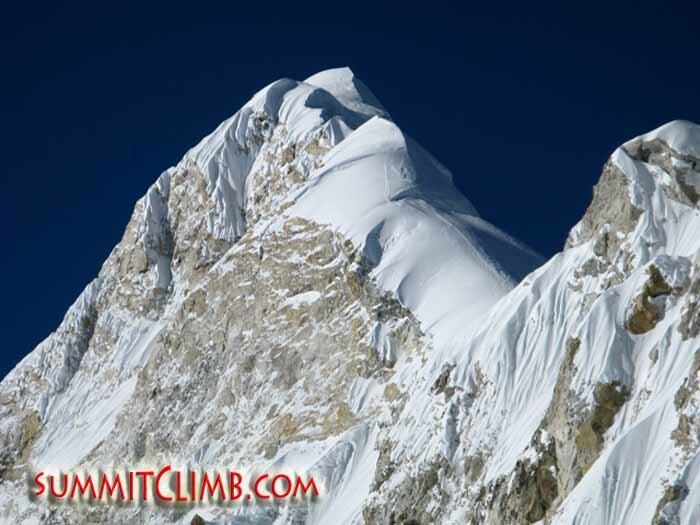 www.EverestClimbNepal.com and www.LhotseClimb.com . 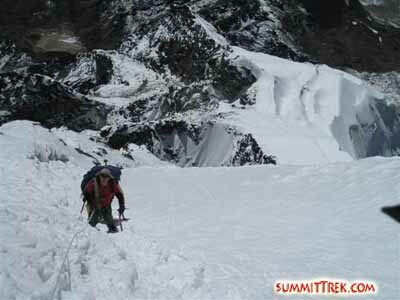 ‘EASY’ EVEREST NORTH COL CLIMB: 28 days in April or May. Join Dan Mazur and head for the ‘shoulder ‘of Everest to see how you feel at 7000 metres climbing high on the most famous mountain in the world while exploring exotic Tibet. Dan will teach you everything you need to know. If you feel well on the Col, you could carry on to the summit. 4 members are currently enrolled for April and 3 for May. Full Service Cost: $6750, £4050, €4550. www.NorthColClimb.com. PAYMENT NEWS: Please charge the entire cost of your trip to your credit card using our secure payment facility. 1) 5% cash paid to you for referring a friend or colleague to our team. Please mention to your friends. 2) 5% discounts for groups of 2-3. 3) Free sherpa for full-service groups of 3 on Everest, Cho Oyu, Lhotse, Ama Dablam, Baruntse, and Shishapangma. 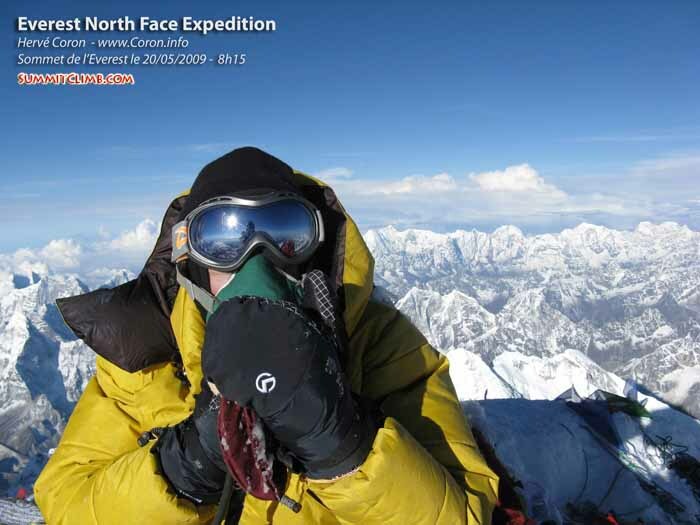 Includes free sherpa oxygen on Everest and Lhotse. This is a $7500, £4650, €5150 value. 4) 10% for groups of 4-6. 5) 15% for groups of 7 or more. 6) 5% for returning members. 9) Are you a mountain guide or would you like to become one? Learn about the 10% discount when you visit www.LeaderInTraining.com . PLANE TICKETS ARE AVAILABLE. Return flights from UK-Kathmandu-UK are about 650 pounds, 750 euros, $1000 USD. Please ring or email if you need assistance with the above fares. ARE YOU FIT? We want you to be in shape for the climb, so please send us an email with your training inquiry and we will forward training recommendations. PLEASE EXPRESS YOURSELF! Do communicate all of your thoughts, questions, and ideas. We wish to build another top team this year by working together and enjoy discussing our favourite subject: MOUNTAINS. Thank YOU VERY MUCH for reading this and PLEASE forwarD to all of your friends and colleagues. MOUNT EVEREST FROM TIBET: www.EverestTibetClimb.com : 68 days in April and May. Full Service Cost: $23,450, £14,150, €15,750. Less expensive than Nepal, made famous by Mallory and Irvine in 1924. 6 members currently signed. ‘EASY’ EVEREST NORTH COL CLIMB: www.NorthColClimb.com : 28 days in April or May. Full Service Cost: $6750, £4050, €4550. Climb to 7000 metres on Everest to see how you feel at altitude on the most famous mountain in the world while exploring exotic Tibet. If you feel well on the Col, you could carry on to the summit! 4 members are currently enrolled for April and 3 for May. CHO OYU: www.ChoOyuClimb.com : 38 days in May or September. Full Service Cost: $10,950, £6650, €7350. 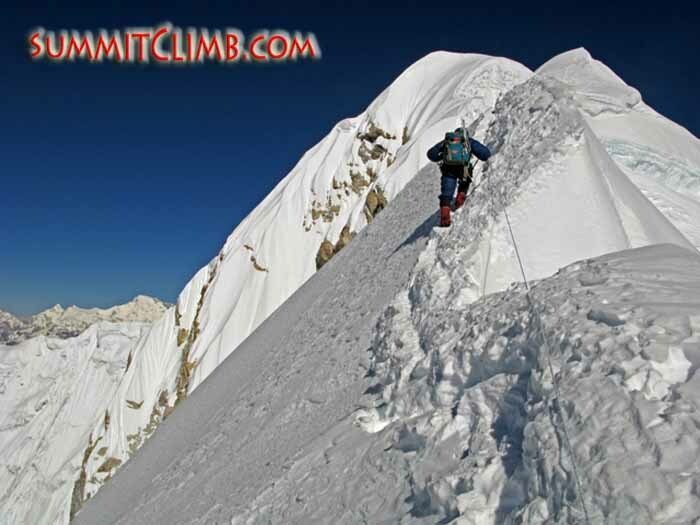 Easy snow climb on the ‘easiest’ and most accessible of the world’s fourteen 8000 metre peaks. 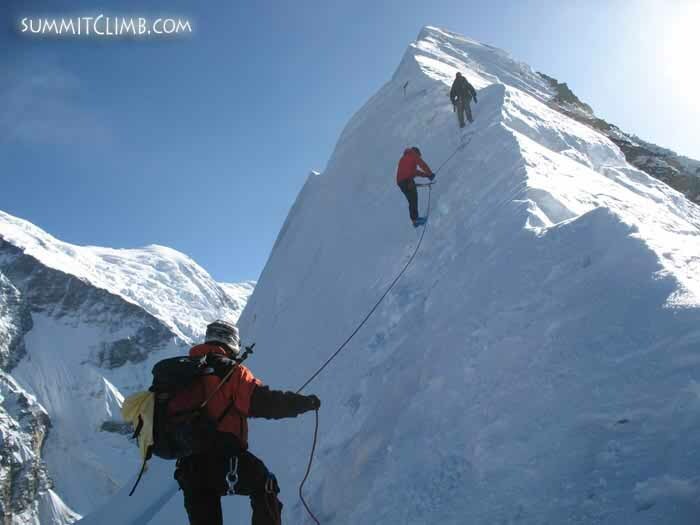 We have 3 members for Cho Oyu in May and 5 for Cho Oyu in October. 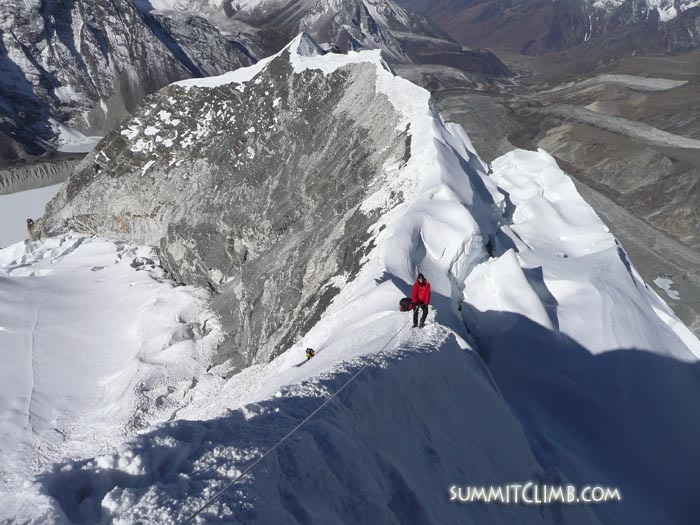 Gary at 5850 metresgoing for the summit of Lobuche East during our Everest View Glacier School (Keith Whelan). 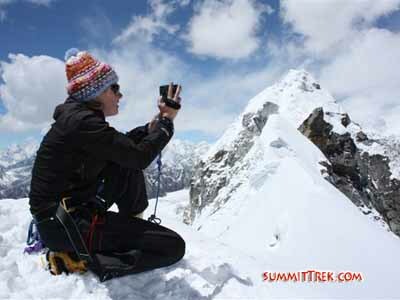 Squash videoing the view from the summit of Lobuche (Keith Whelan). 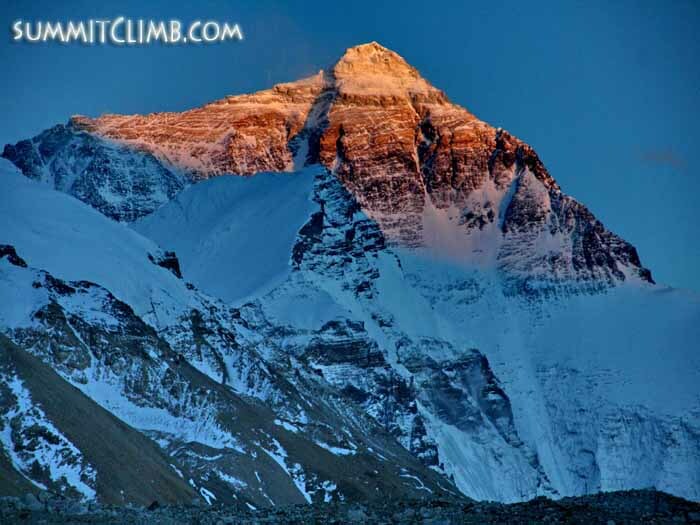 LHOTSE: www.LhotseClimb.com : 68 days in April and May. Full Service Cost: $10,950, £6650, €7350. World's 4th highest mountain, climbed from the same route as Everest-Nepal. 3 members have signed. ALPS MEET: www.AlpsMountainMeet.com : 27 February-13 March. Meet is free of cost, no charge. Join for 1 or 2 weeks of fun skiing-boarding and winter climbing in the Alps. The first week will be spent in Tignes and the second in Chamonix. Accommodation cost is $75, £45, €50 per day, which includes hotels and two meals a day. 8 men and women have joined, with room for just a few more. AMA DABLAM: www.AmaDablamClimb.com : 32 days in October. Full Service Cost: $5650, £3350, €3750. 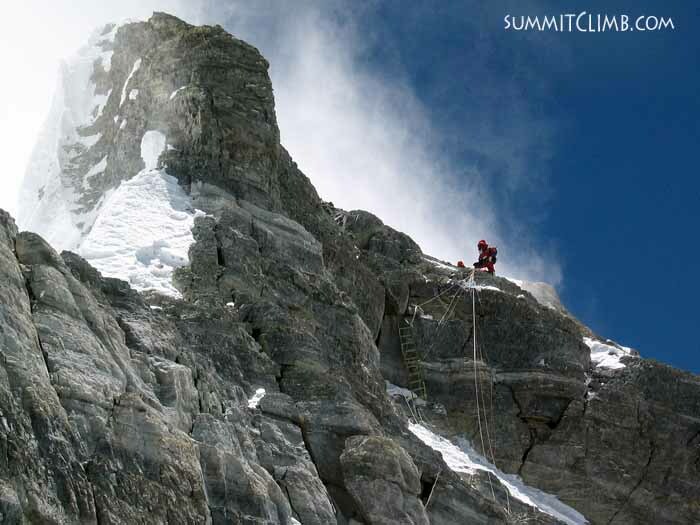 The most famous rock-ice-snow climb in all Asia. Technical but accomplishable, just 20 kilometres/12 miles from Everest. 4 members have joined the team. MERA PEAK: www.MeraPeakClimb.com : 22 days in October. Full Service Cost: $2750, £1650, €1850. Walk-climb beautiful and remote Mera Peak, with some of the best views of Everest possible. 2 members have joined. ISLAND PEAK CLIMB: www.IslandPeakClimb.com : 22 days in April, May, or October. Full Service Cost: $2750, £1650, €1850. 5 day option: $1050, £650, €750. Nepal's famous 'trekking peak'. Climb to 6000 metres in just one day. 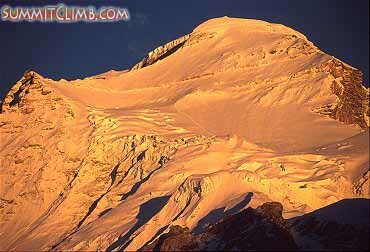 ACONCAGUA: www.AconcaguaSummitClimb.com : 1-20 February. Full Service Cost: $3450, £2050, €2450. The highest peak in all the Americas and one of the famous ‘7-summits’. 5 members are currently on the team. MUSTAGATA CLIMB: www.MustagataClimb.com : 25 days in July. Full Service Cost: $4450, £2650, €3050. The world’s ‘easiest’ 7500 metre peak. Walk, climb, ski, snowboard, snowshoe, and snow-raquette to the summit of Mustagata and down. Leader Jon Otto will teach you everything you need to know, has climbed it nine times and you will enjoy not only his friendship and care, but his ability to speak perfect English and Chinese is impressive. 4 have joined the trip already. KILIMANJARO: www.KiliTrek.com : 14-22 February or 1-9 August (9 days): Cost $2950, £1750, €1950. Fun walking to the summit of the highest peak in Africa. 3 people are signed on. EVEREST BASECAMP WALK NEPAL: www.EverestNepalWalk.com : 18 days in April, May and October. Full Service Cost: $1850, £1150, €1250. Walk to Nepal's most famous and beautiful basecamp first climbed by Sir Edmund Hillary and Tenzing Sherpa; hike the scenic view ridge of Kala Pattar with stunning views of Everest. EVEREST BASECAMP SERVICE WALK: www.EverestBasecampServiceWalk.org : 22 days in April. Donation: $2750, £1650, €1850. (100% of your contribution for the walk and your international flight are tax deductible). Join a support walk to the Pema Choling Women’s Convent also known as the Deboche Nunnery, where a water-line project is in progress, then walk to the famous Everest Base Camp and Kala Pattar, with incredible views of Everest. CHO OYU ADVANCED BASECAMP WALK: www.ChoOyuTrek.com : 18 days in May and September. Full Service Cost: $2950, £1750, €1950. Walk to Cho Oyu advanced basecamp at 5700 metres to visit the sixth highest & most accessible of the world’s fourteen 8000 metre peaks, near the historic Nangpa La with stunning views of the highest mountains in the world. Thank you very much for reading this newsletter and forwarding it to all of your friends and colleagues.